Try a New Adventure – Snowmobile Tours! Snowmobile tours; A unique Vermont adventure! 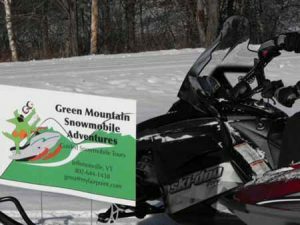 Experience Vermont snowmobile tours with Green Mountain Snowmobile Adventures of Jeffersonville, Vermont. The day tours loop through the Green Mountains of Vermont by accessing the VAST network of trails. Call 802-644-1438 to reserve a 1 or 2-hour tour; largest tour group is no more than 4 sleds. Start by signing in and meeting your personal guide, then get fitted for a helmet, a short training on the most important aspects of how to ride/drive a snowmobile and you are on your way! The tour is a small group so you can feel comfortable going at your own pace. Doing other activities during the day? How about an evening snowmobile tour through Smugglers’ Notch Park? These tours leave at 5,6 or 7 pm out of Smugglers’ Notch Resort. Please call 802-644-1438 or 802-644-1173 to reserve. What to wear on snowmobile tours: Helmets are provided, please come dressed in snow/winter apparel: Gloves, coats, boots, and snow pants. Reservations are required: 24 hours in advance for day tours, 1 hour in advance for evening tours.